Today, SLAYER unveil the album artwork for their 11th studio album, Repentless, due out September 11, 2015 via Nuclear Blast. 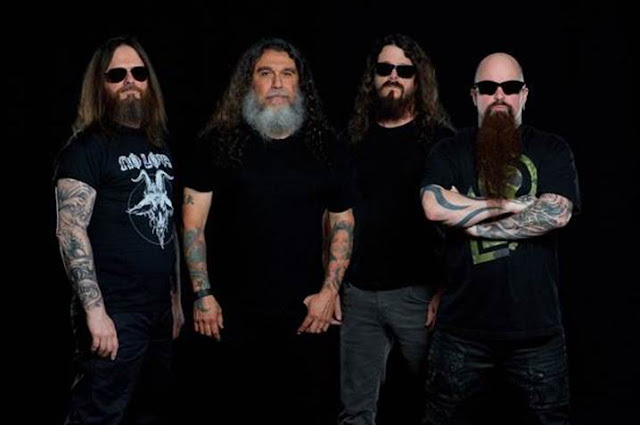 The artwork was created by Brazilian artist Marcelo Vasco in collaboration with the band’s Tom Araya and Kerry King. 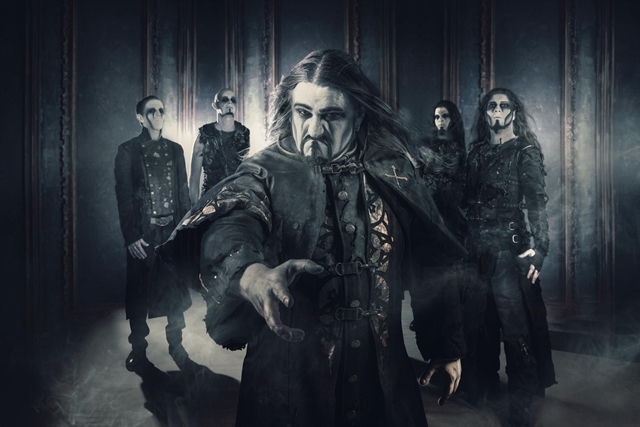 Following their critically acclaimed chart topping album Preachers of the Night, POWERWOLF are back and ready to enthrall with their new masterpiece Blessed & Possessed. The album will be released July 17th in North America and is available for pre-order from the Napalm Records Webstore HERE. "Armata Strigoi is one of the songs on Blessed & Possessed that have this forceful ahead approach while maintaining that very unique POWERWOLF atmosphere to me. Lyrically the song is about the creature referred to as "Strigoi" in eastern European mythology, a creature that might be considered the prototype of what became the vampire, though originally rather connected to spiritual roots. We love to research how mythology evolves and develops, stuff like that is our fuel for lyrics." 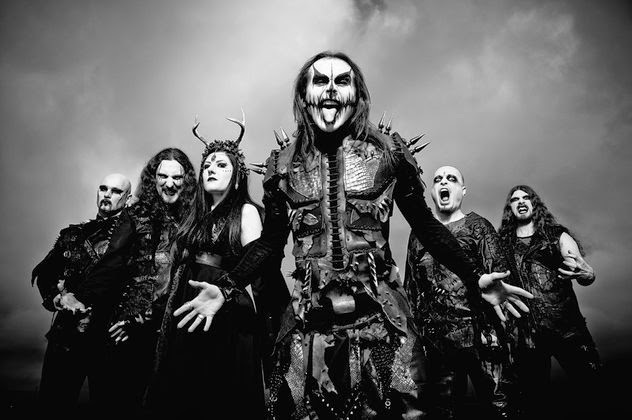 CRADLE OF FILTH - Right Wing Of The Garden Triptych (OFFICIAL VIDEO) from Nuclear Blast on Vimeo. New Jersey’s progressive metal masters SYMPHONY X are set to release their ninth studio album 'Underworld' on July 24th via Nuclear Blast Records. As a teaser for fans who can't wait to hear the new offering, the band decided to reveal the opening track of the album. SYMPHONY X have triumphed, creating a panoramic 'album rock' experience in an era cursed with diminishing attention spans. “This new one is about the song, really crafting each one on its own, to be as strong as it could be”, says Michael Romeo the chief writer in the band and proprietor of The Dungeon, the tricked-out studio in which the album was crafted. The studio is newly equipped with the latest technology to execute the band’s famous symphonic and orchestrated touches. “The sensation of finalizing our newest album is one of relief and joy, wrapped within a massive whirlwind of excitement,” commented founding guitarist Dino Cazares. “We really feel this is a very special FEAR FACTORY album. While being careful not to replicate ourselves, this album still has a very classic FEAR FACTORY vibe that we feel will appease both old and new fans. The aggressive, melodic and industrial elements are all intact and shine more than ever. “Burt and I produced the album with Rhys Fulber co-producing. Damien Rainuad and Giuseppe Bassi handled most of the keys and pre-production. We also enlisted the masterful metallic skills of Andy Sneap for an amazing mixing job! Genexus will be released on August 7th worldwide via Nuclear Blast Entertainment. The record was co-produced by long-time collaborator Rhys Fulber, along with Cazares and Bell and mixed by Andy Sneap (ARCH ENEMY, TESTAMENT, EXODUS, MACHINE HEAD). 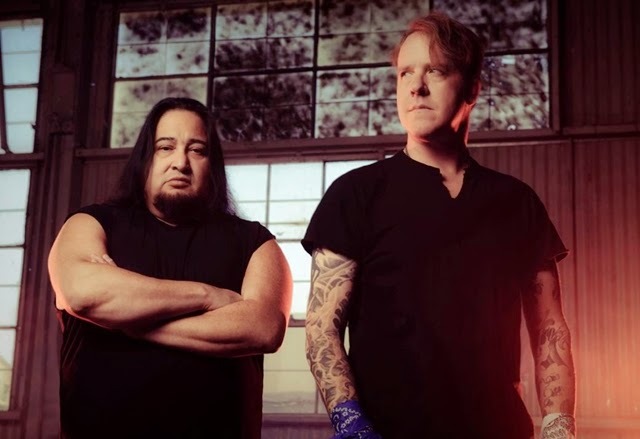 FEAR FACTORY will hit the road this July in anticipation of their upcoming Nuclear Blast Entertainment debut. Tickets go on sale everywhere on Friday May 22nd at 10 am local time. Additional headlining FEAR FACTORY shows to be announced shortly. 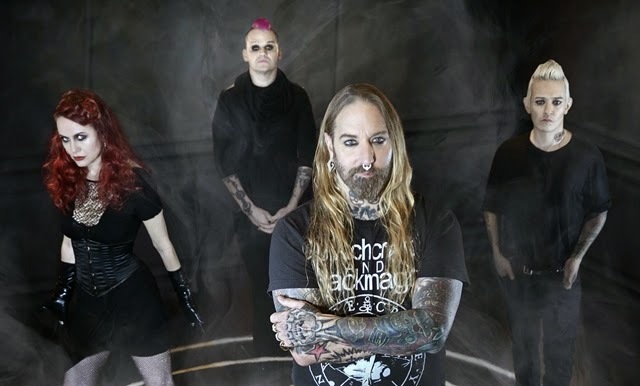 COAL CHAMBER PREMIERE NEW VIDEO FOR "I.O.U. NOTHING"
COAL CHAMBER will release their new album Rivals on May 19th in North America via Napalm Records. This is the band's first new album in over thirteen years. With producer Mark Lewis at the helm, Rivals makes it seem as if COAL CHAMBER never took a break at all. They picked up right where they left off and have delivered what some may consider their best work to date. The creators of CINEMATIC METAL are finally back with their most outstanding record: Prometheus, Symphonia Ignis Divinus, which is set to be released on June 22nd by Nuclear Blast Records. 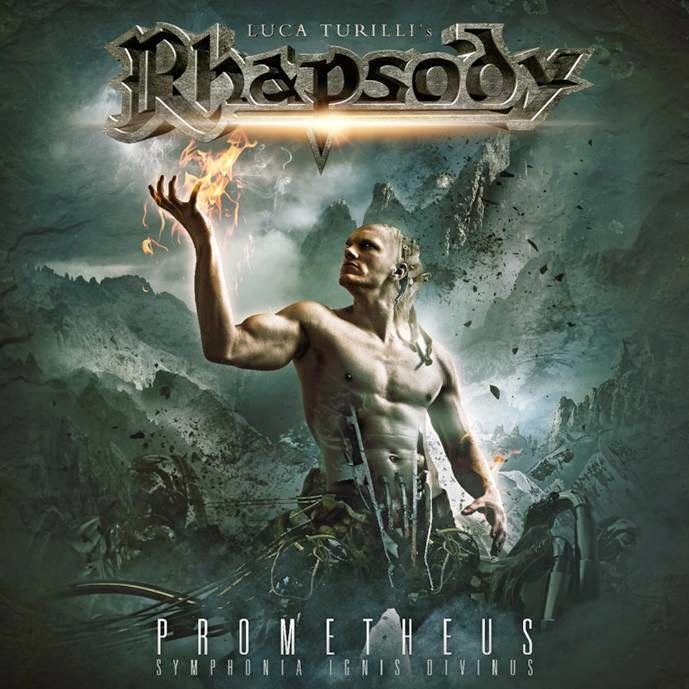 The album was composed and produced once again by Luca Turilli, responsible as always of all the orchestral and choral arrangements. It was recorded and mixed at the Backyard Studios of Sebastian Roeder (Bonfire a.o.) and mastered by Christoph Stickel (Michael Schenker’s TEMPLE OF ROCK a.o.) at MSM studios. And this time it was not enough for the band to simply sound CINEMATIC. It came the time for RHAPSODY to finally “look” CINEMATIC too. Therefore, the new cover artwork and the album booklet, introducing the new cinematic graphic style of the band, were realized by the well-known amazing artist named Stefan “Heile” Heilemann (EPICA, LINDEMANN a.o.). Produced by Jaime Gomez Arellano (GHOST, ULVER, CATHEDRAL) at London's Orgone Studios, the frostbitten riffs thunder beneath the bittersweet euphoria of Nick's vocals, drifting between rich melodic soars and icy snarls. It's an organic body of work that confronts the trials and tribulations of struggling alone in darkness, but also one that treads incredibly exciting and genuinely "new" sonic ground in the process. "Since their late 80's inception, through somber abrasiveness of their debut and harrowing tristesse of groundbreaking 'Gothic', the unparalleled icons of gloom, PARADISE LOST grew deep into all things murky and dreadful in modern music. 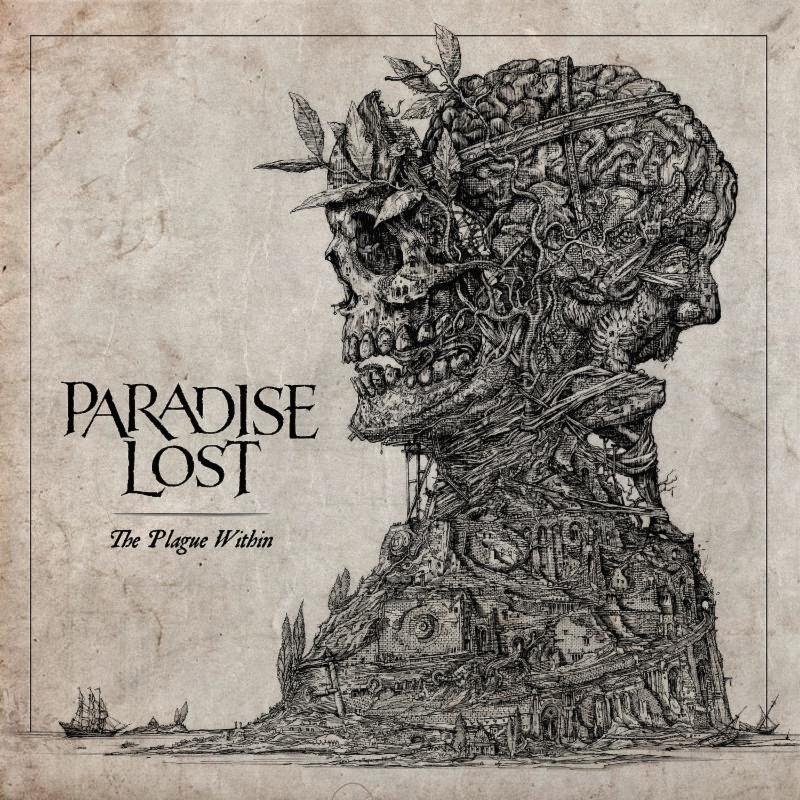 Let alone Duncan Fergado's artwork for their 'Lost Paradise' debut remains one of my fave covers, so having heard that with 'The Plague Within' the band harks back to days of old, was - to say the least - a thrilling incentive to pick up the commission. It was also a rare joy to see how preliminarily calm and reflective Arcimboldian artwork, kept becoming ever darker and more sinister past each of Nick's and Greg's scrutinies, to finally become what one can see on the actual cover. A portrait of hopeless decrepitude of mental illness - which is what 'The Plague Within' deals with thematically - where the tormented Sisyphus struggles to push his burden back up the slippery walls of a long frozen illusion." Portuguese Gothic Metal pioneers MOONSPELL first brought the dark flames to their native country - and then set the rest of the world aflame with milestone albums including Irreligious and Night Eternal. Now with their eleventh studio album Extinct, the band has erected yet another monument in the realm of gothic music. Extinct will be released March 17th in North America and is available for pre-order from the Napalm Records Webstore, and Amazon. In support of the album, MOONSPELL will be returning to North America at the end of April. 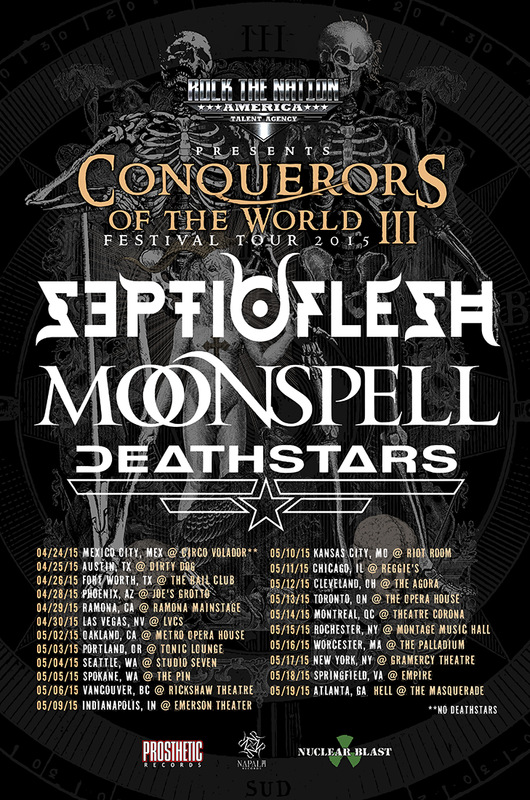 The band is teaming up for a North American tour alongside Septicflesh and Deathstars. The tour starts April 24th in Mexico City, Mexico and runs through May 19th in Atlanta, GA. A complete list of dates can be found below. "We love this album, we love everything we did so far, that we love playing it for you, the wolves, the lack of love, the sleepless nights, friends who wear gone. And we want to share that with you. So be there, rock it out and let yourselves be invaded by our music. You shan't regret it."